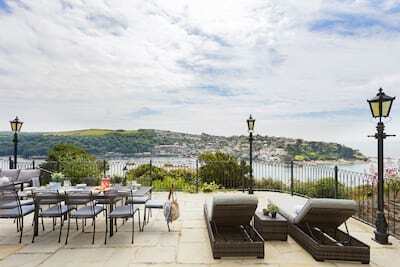 As featured in OK Magazine and The Telegraph, Rosilian Hall, set on the banks of the River Fal, South Cornwall, is a large breathtaking waterfront residence created with optimum luxury and grandeur in mind. 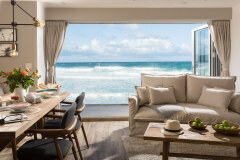 Ten superior bedrooms offer a holiday home for up to 20 guests whilst spacious entertaining rooms bring friends and family together in style against the unrivalled coastal backdrop. 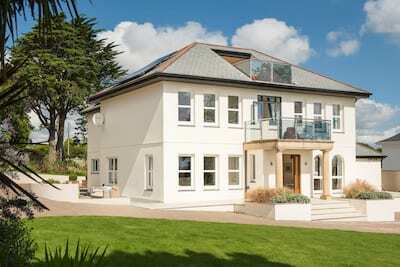 This substantial luxury large holiday home is located in the much sought after location of Flushing, just moments from the cosmopolitan maritime town of Falmouth. Step out into the established grounds and immerse yourself in the ebb and flow of the river life as you wander down to your private beach access and characterful boathouse. Views stretch across the sailing waters of Carrick Roads and away down the river. Arrive by land or sea as Rosilian Hall offers a private mooring and slipway. Follow the quintessential lanes through south Cornwall and arrive at the majestic oasis of Rosilian Hall dating back to 1908. Once inside, the Salon sets the scene as guests gather under the stone arches which perfectly frame the river views beyond. From the moment you arrive, this enviable home brings together iconic character and elegance of space with practical luxury. Unique French antiques dominate the interior style complemented with fine art and original period features. The hall is set over four floors with the collection of ten bedrooms and bathrooms set over the first and second floors. Each bedroom has been flawlessly presented to ensure first class luxury with the finest beds, silk linens, White Company robes and toiletries and the owner's romantic flair. 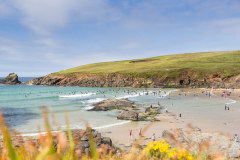 The generous social spaces welcome lazy summer days as friends and family unplug from everyday life and swap busy timetables for a Cornish pace of coastal life. The kitchen becomes the hub to the house as guests gather over coffee and map out the day's adventures. Designed by Mark Wilkinson, the fully fitted kitchen offers all you need for the perfect holiday menu. For late breakfasts and children's suppers, the Orangery offers an informal dining option for smaller groups, children will enjoy the collection of toys and relaxed space to play. Dress the dining table to impress for lavish dinners and dine in style, from milestone birthdays to anniversaries, the elegance and beauty of this formal room is hard to beat. Set up the pool table for a family knockout tournament. The Drawing Room lies at the gable end of the house with panoramic views of the river, relax at the end of the day or enjoy a serene afternoon with a good book. For those that need to keep abreast of life at home, the formal Study offers a quiet retreat. 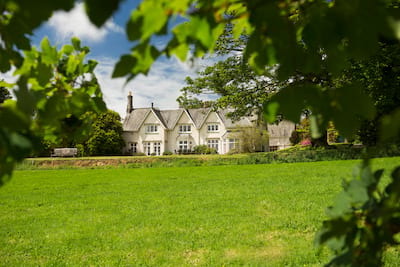 Rosilian Hall is set within 1.6 acres of established grounds. 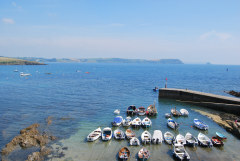 Step out onto the generous stone upper terrace and dine al fresco as the boats sail by. Games are played on the lawn and lazy days are enjoyed as families. The garden offers secluded pockets of garden in which to pull up a sun lounger and switch off. An indulgent seats 6 hot tub bubbles on the terrace capturing the jackpot views of the river. Follow the pathways and head down to the private beach with slipway and charming boathouse complete with 10 kayaks and life jackets to help get everyone out on the water. 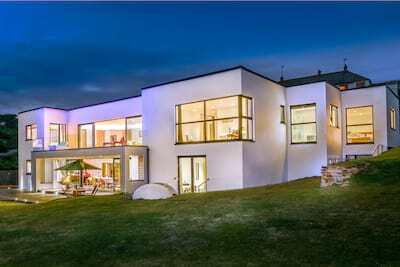 The house is set behind tall stone walling for privacy and security and is accessed through large electronically operated sliding entrance gates. From your holiday door, wander into Flushing and choose from a number of places to eat from The Royal Standard or Seven Stars pubs or a tasty lunch on the quay at The Waterside complete with panoramic river backdrop. The Flushing Ferry runs year round linking the village to Falmouth, a great choice combining a river trip and exploration of maritime Falmouth. 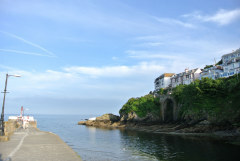 Or, take a short water taxi direct to Falmouth from the quay just 3 minutes from your doorstep - a great way to travel to and from the vibrant harbour town. This most wonderful stretch of coastline is a mecca for sailors the world over with its sheltered waterways. Discovery Quay is a wonderful place to watch the world go by in Falmouth, pick up Rick Stein's fish and chips to enjoy on the harbour wall or dine at one of the many restaurants. 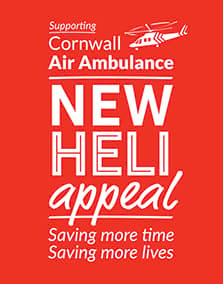 The River Fal Company offer daily ferry shuttles to St Mawes or take a river trip up towards Truro. 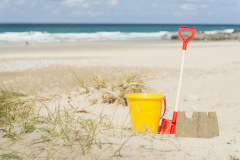 Nearby beaches include Gyllynvase Beach, Swanpool and Maenporth all offering superb swimming waters and water sport opportunities. 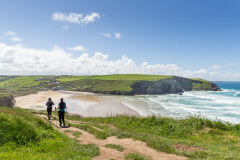 The South of Cornwall has much to offer or hop over to the drama of the high cliffs and rolling surf on the North Coast for a day trip. 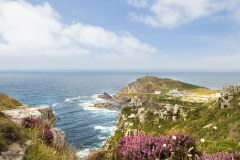 Cornish Gems can offer a host of concierge services to include private dining experiences, private chefs, yacht charter, meet and greet on arrival, child minding, event planning as well as advice on the very best places to visit, dine and explore. Choose from a collection of 10 beautiful bedrooms set on the first and second floors of the hall. Master bedroom: 1st floor. King bed. Private living room with relaxed seating, TV. Copper bath in the bedroom. Sea views. Ensuite. Bedroom two: 1st floor. Emperor zip/lock bed (this bed can be set as x2 3.3ft singles) Sea views. Ensuite. Bedroom three: 1st floor: Zip/lock bed (this bed can be set as x2 2.6ft singles) Sea view. Bedroom seven: 2nd floor: Zip/lock bed (this bed can be set as x2 2.6ft singles) Sea view. A wonderful fully fitted Mark Wilkinson kitchen with all you could need to create the perfect holiday menu. Rosilian Hall ensures superior comfort and tranquility for all with several living spaces in which to relax located on the ground floor. The Salon: A welcoming open plan space with traditional log burner and ample seating. Double doors lead onto the outside upper terrace. The Drawing Room: A collection of beautiful sofas, side tables, traditional real fire, large Smart TV, DVD player. The Study: A comprehensive library, large wooden desk and chair, Chesterfield sofa. The Orangery: Set just a few steps down from the kitchen area with informal kitchen table, comfortable corner sofa and collection of childrens games. Triple glass doors lead onto the upper garden terrace. There are electric gates which secure the property and car park. There are 3 steps from the parking area to the front door. The garden is terraced with pathways and steps leading to various levels. There is an open feature pond within the grounds and terraced walls and the grounds are not completely enclosed due to the beach access - nb. children and pets must be supervised at all times. Access to the beach and slipway is steep but does have vehicular access if required. There are 4 steps from the slipway onto the beach. Limited head height within some of the bedrooms on the 2nd floor. Two internal flight of stairs. 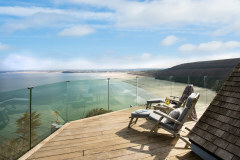 "Forget the old Cornwall, the modern Duchy is now a vibrant place to visit, and where better to explore if from than a magnificent abode [Rosilian Hall]...A grand Cape Dutch-style mansion overlooking Falmouth harbour and now debuting as a rental property, it's almost an insult to describe it as a holiday home. [It] boasts acres of space for entertaining in a luxurious location... there was little reason to leave our well-appointed compound... it felt like the most perfect place on earth." Read the full article here. It's almost an insult to describe it as a holiday home...this elegant, high-ceilinged mansion has acres of space for entertaining inside and out...it felt like the most perfect place on earth. Mariella Frostrup, The Telegraph. Read Mariella's full review here.